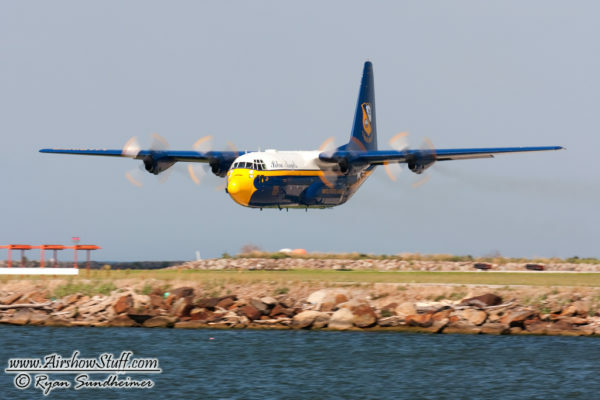 The US Navy Blue Angels’ famous C-130 Hercules transport known as “Fat Albert” or “Bert” will not be performing with the team in Seattle this weekend. The team, which arrived in the area yesterday, announced that due to mechanical issues the aircraft will have to undergo maintenance instead of making the trip. Bert is operated by an all-Marine crew and serves to transport the team’s equipment and personnel to each show site. Traditionally when Fat Albert is down for any reason, the Angels’ transport needs are met with a standard fleet C-130 that is dubbed “Ernie”. The Seattle Seafair airshow will still showcase the five F/A-18 Hornets of the team, which performs at the event every year. Hopefully Fat Albert will be back soon!